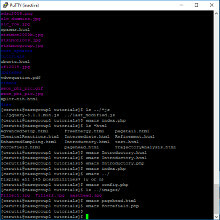 A basic knowledge of how to navigate a filesystem, execute commands, and to create files and folders is a prerequisite to understanding the rest of the Amber tutorials. Basic competencies in Unix and command-line interfaces are part of a core computing proficiency and will serve you well in other pursuits. Increasing fluency will ensure that you get the most out of the content offered on this site. The link provided at the top navigates to an interactive Unix tutorial through Codecademy, and is ideal for beginners. You will need to create a free login to use it. There are many other resources for Linux and Unix, but this is in the right ballpark. This tutorial demonstrates rudimentary system building in LEaP, the main program for preparing simulations in AMBER. 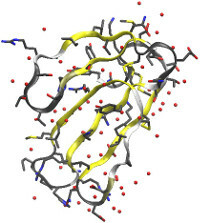 The tutorial serves as a nice reference for different kinds of files used in the LEaP program, introduces the workflow, and provides a simple example of building a protein in water. This tutorial is designed for new users who have little or no experience with running molecular dynamics simulations. It assumes no prior knowledge of AMBER or Linux but assumes that AmberTools 14 as well as VMD are correctly installed on your system and AMBERHOME is set correctly. If you are new to AMBER and MD in general this is the place to start. This tutorial will act as a basic introduction to LEaP, sander and ptraj, to build, solvate, run molecular dynamics and analyze trajectories. It will also cover visualising trajectories using VMD. The aim of this tutorial is to act as a brief introduction to running classical molecular dynamics simulations using the AMBER software. In this tutorial we will create a initial structure for a 10-mer of DNA and then we will run gas phase, implicit and explicit solvent simulations on it. Finally we will look at a practical example of how MD simulations can be used to investigate how A-DNA can convert to B-DNA. This tutorial acts as a brief introduction to using VMD for visualising AMBER inpcrd, restrt and trajectory files. While only scratching the surface of what VMD can do it covers setting up a .vmdrc file to set the default layout of VMD, loading static structures and performing RMSD fits between similar structures. It then goes on to cover loading and visualising AMBER trajectories, both from gas phase/implicit solvent simulations and from periodic boundary simulations and shows how to save individual frames from a trajectory as well as create an MPEG video of the trajectory.